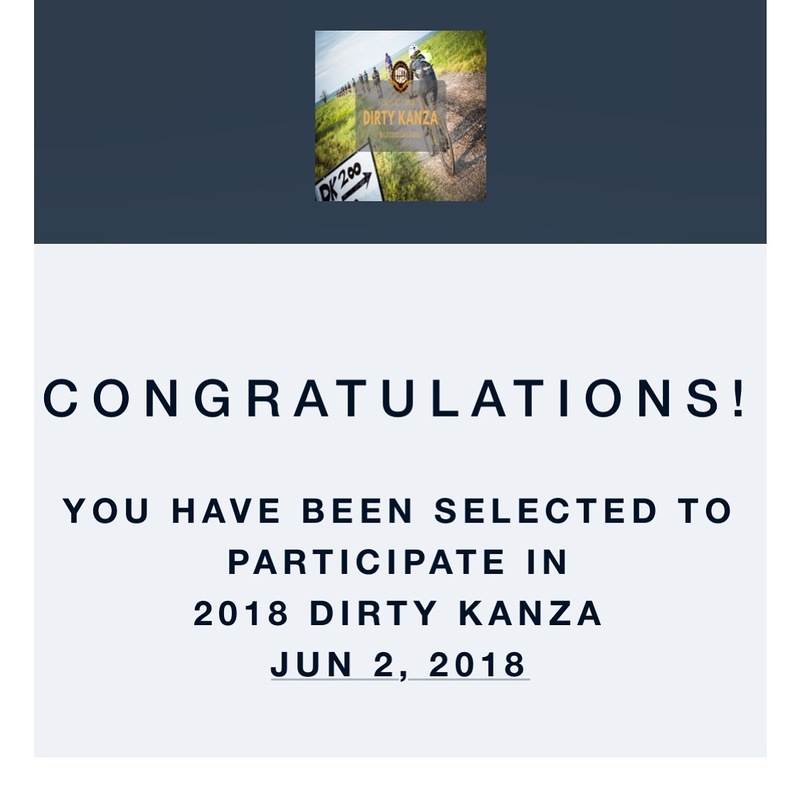 Dirty Kanza is the premier gravel race in the country. 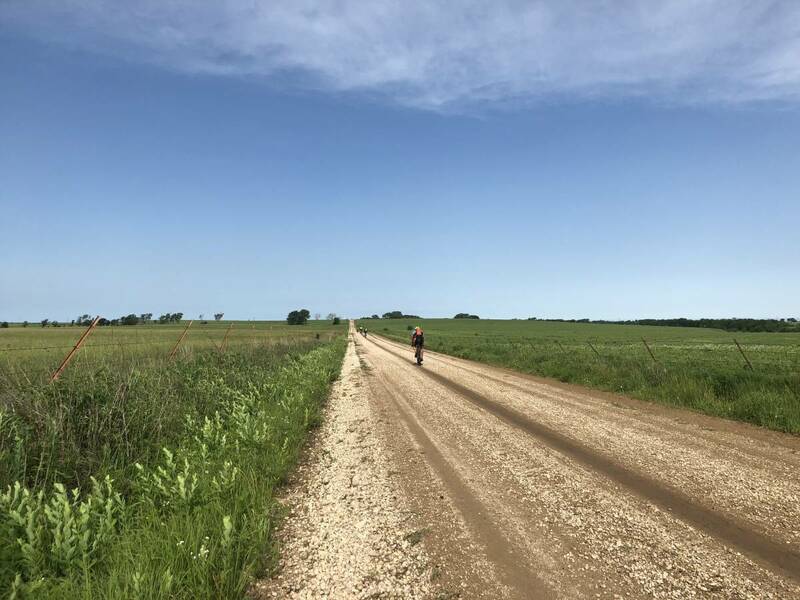 It is a 200 mile ride on rural and rough gravel roads south of Emporia, Kansas that takes 2,700 riders the better part of 24 hours to complete. It is a test of one’s mental fortitude as well as physical ability, and that is without all the pitfalls along the way. The weather can vacillate between endless rain and mud bogs to withering heat and wind that taunts riders to quit. The event has a mighty following and is very difficult to get into. The first year I tried to enter I got cold feet and didn’t click the “register” button. Even before entering, I was scared about the amount of time I would need to train, the gear, and the commitment, the support of my wife and kids just wasn’t where it needed to be. I watched as the field filled and closed and just dreamed that someday I would have the courage to do it. I trained for and did increasingly longer events like D2R2, improved at GFNY, rode Mt Evans, raced the Tour of the Battenkill, Tour of the Catskills and became a little closer to tackle DK200. The second year I tried to enter I had a plan. I cleared the time I would need to train with my amazingly supportive wife. I talked to my CTS coach about entering and incorporated it into my plan for the year. I purchased a Rodeo Labs Trail Donkey and had the prefect gear to tackle such a demanding event and had the desire and drive to stare down the barrel of DK200 and not flinch. I went out for a three hour training ride at 6am on the January morning of event registration. I planned to return at 9:00 am to give myself an hour before I had to click “register” at 10am. I was so excited and so pumped until I sat down at the computer and saw that every field already said closed. WHAT?!?! I started clicking around, desperately trying to figure out what went wrong and realized that the registration opened at 9am Central Standard Time. 10am on the east coast. I missed my chance with a bonehead move and wasn’t going to get a slot for 2017. I was so crushed I broke down in tears at my desk. My wife and kids came running out and wondered why I was inconsolable and I told them I didn’t get into my race. I was devastated. I had already been planning and training; to not have the chance was crushing. I scrambled for weeks on message boards and with friends trying to get a slot and after about three months I gave up on the off chance of getting a transfer entry for 2017.
that I was in!!!! …..and scared. Even before I heard about my 2018 slot I started doing the base training I would need for the event in hopes I would get in. I was ramping up my miles and building the foundation I would need to withstand such an incredible test of fitness. The winter was as usual in NYC cold, wet and bitter but I was excited at the prospect of doing the DK200 that I threw myself into the work. I had had a long and detailed conversation with my wife about what it exactly entailed to train for this event. Lots of long rides back to back and a lot of time she would have to take control of the family ship while I was focusing on this goal. She wholeheartedly supported me and did so much extra work with the kids it was amazing. 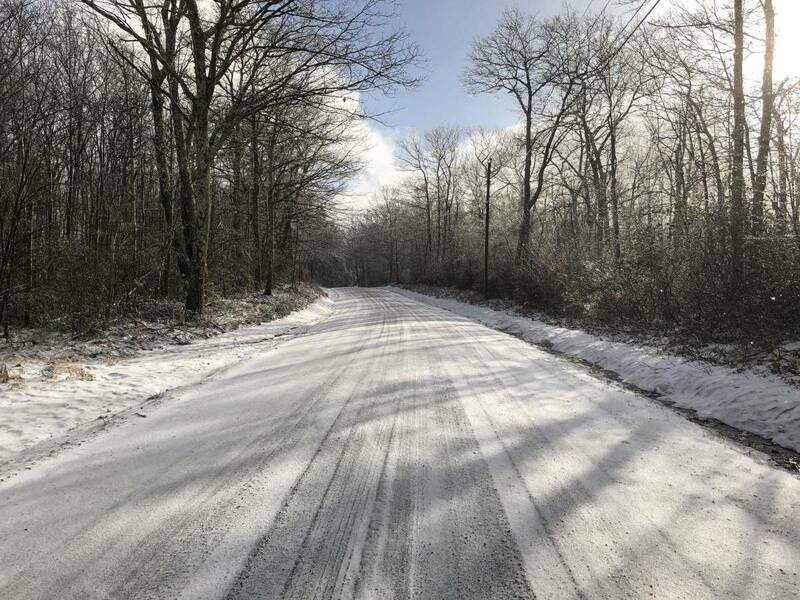 During the Christmas and Presidents Weekend vacations I was logging miles in Dutchess County New York on gravel roads that were unmaintained and snow covered. I would regularly take the family snowboarding at Catamount, a small local ski area near the Berkshires, in the morning and then switch clothing into winter cycling kits and ride home from the mountain. The double dose of exercise and the treacherous and frigid conditions were all key elements to harden my resolve and mental stamina to withstand the DK200. 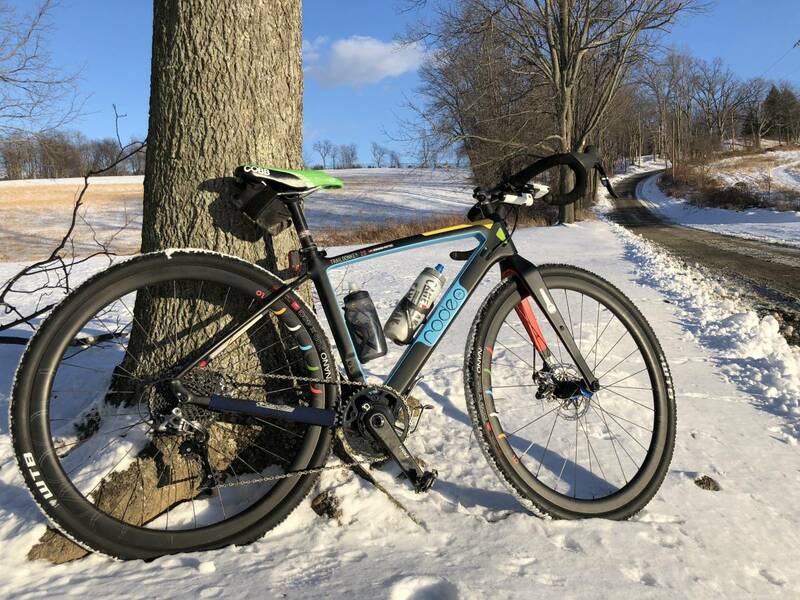 These winter rides are always a favorite of mine but with each and every one I stretched myself further and did more and more rough long winter miles. 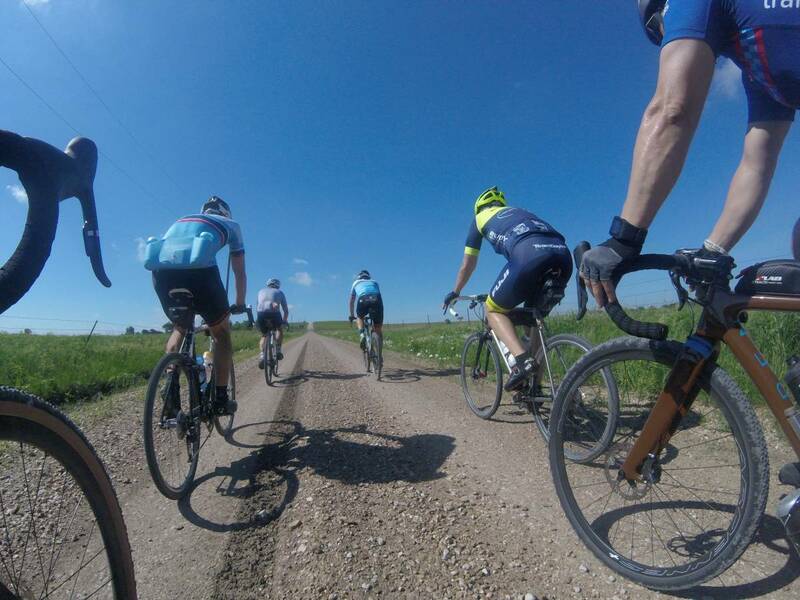 As preparation for DK200 I lined up a solid and fun series of events. I started with the Sourland Semi Classic in Hopewell New Jersey on February 25th. It is a 100k early season race that features some great dirt roads in the are right near where Washington crossed the Delaware river. The day was as much a mental challenge as a physical one because it was 40º and raining for the whole day. The cold and wet soaked the day and really chilled the riders to the bone but with each and every frigid mile I knew that these small tests of will and ability would serve me well as I prepared for my goal of DK200. I remember riding up alongside Selene Yeger who had had a very rough day at DK200 the year before and I asked her if she would be going back. She looked over and sort of abruptly said “No! I’m going to Michigan.” I remember hearing in her words a trace of animosity and pain about her DK200 experience and remembered the Instagram post where she talked about what a rough day it had been. I was shocked that such a strong and accomplished rider could have had such a rough day making it to the finish line and had the experience Chris Carmichael was telling me to seek. The challenge that lay ahead and the fear I had started growing. My second event of the season was the Croatan Buck Fifty in Cape Carteret North Carolina on March 17th. This inaugural event was brought to my attention by Stephen at Rodeo Labs and there was to be a pace of (Trail)Donkeys there. We all rented a beach house together and had a blast of a weekend! I really hope this becomes a Rodeo tradition and the Rodeo Beach House becomes a thing. 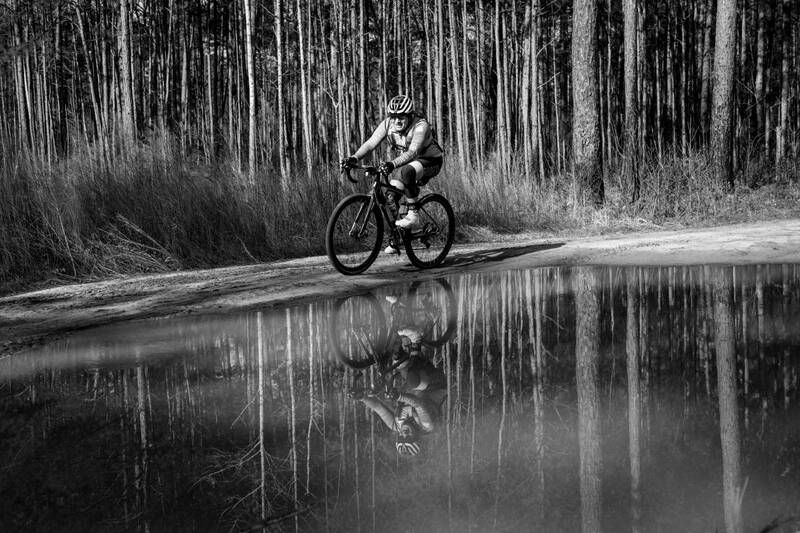 The event is 150 miles through the Croatan National Forest, a 50 mile out and back course that included Savage Road on the way back. Savage road is a three mile stretch of mud bog road that is impassible by any vehicle other than a tank, side by side or two wheeled machine. The mud holes are so big that they could literally swallow a full sized pick up truck. The only way through is to stitch the sometime six inch wide bridges between holes together to form some sort of track. It is so rough and thrilling and hard that it broke the route up into three passes that demand all of your attention. Matt from Ridge Supply and Gordon were the ultimate ambassadors of Stoke and put on such an awesome event that I will surely be back. My ride went off without a hitch and all my training and preparation worked. I ate and drank as planned, had legs to push through and achieved my longest ride ever that day. Along the way, I learned an important lesson. As usual I went out way too hard and tried to hang on to a front group for 30 miles until (after half hour of telling myself to let go and ride my own pace) I finally let them slip away. This meant that I did 120 miles of it solo. It was a wonderful opportunity to get myself ready to “do me” for a while. I was able to pace myself and test my fitness. When I finished the day, I felt great and was so thankful that I executed the day the way I wanted to. A good omen for my scary future DK200 attempt. The next months were a very busy time for my family and life. Spring break, work travel, moving, moving sculptures and Dad duties sort of took over. I trained all along, waking before dawn and getting in the miles. Riding on the road in North Carolina, Ohio, Chicago, Denver and many, many places in between. I did weeks of 200 miles a week with centuries many weekends, building up my fitness and ability to ride long miles. Several events I had on the calendar either were cancelled for snow or were missed by me because of life. I knew I needed to plan a huge day as a test for DK200. I mapped out a route starting at my apartment in NYC that went up to Bear Mountain on an amazing gravel path along the Hudson River, then 50 miles through Harriman State park, then back down to NYC inland following the GFNY back half with all the tough climbs. The day ended up being 153 miles, 11 hours and 30 mins solo self supported and amazing. I used Instagram as motivation and shared videos at the start, 50 mile, 100 mile and finish to keep me accountable and excited to get there. It was a fantastic day and I surprised myself with my fitness and ability to ride 150 miles with 12000 feet of elevation. Then we moved. I was the family point person for the move. The stress, work, fatigue impacted the consistency of my training during the week. I was still getting in centuries on the weekends and putting in 150 mile weeks but felt like I was falling off my peak. The weeks before DK200 were rough and I really started to worry I was letting something go down the drain I had worked so hard for. The fear and anticipation was growing and the thing Chris had said was really coming true: Could I even do this? I pressed on with the preparation and packing and felt scattered and scared but also excited and as ready as I was going to be for this. 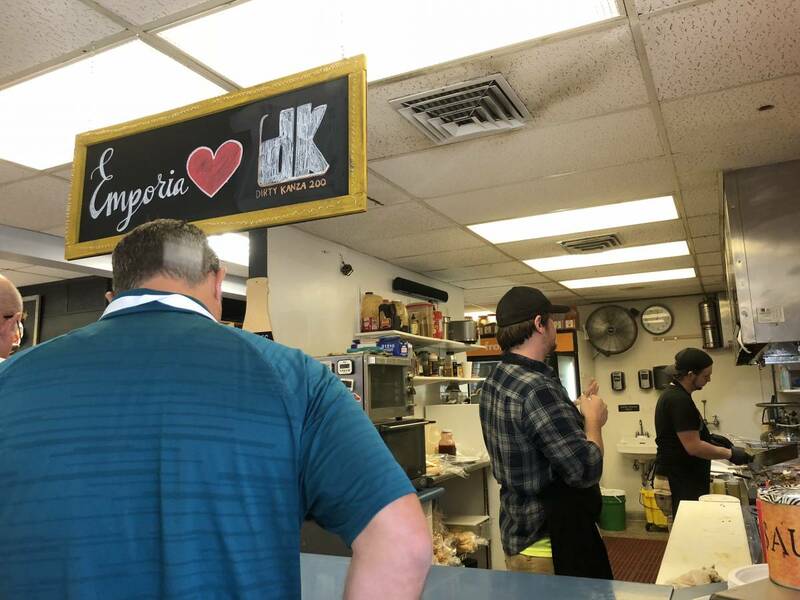 When I rolled into Emporia on Thursday May 31st I was a mix of happy, worried, ready, unprepared and nervous. The car pulled into the parking lot of the ESU dorm where I was to stay and stopped right in front of the CTS support crew that was there to help riders. I was met with smiles, excitement and help and a team of people who wanted me to succeed. I was instantly filled with gratitude for my family, coach, gear, preparation, planning and support that the nerves and negative emotions were reduced to a manageable size and I got really stoked. 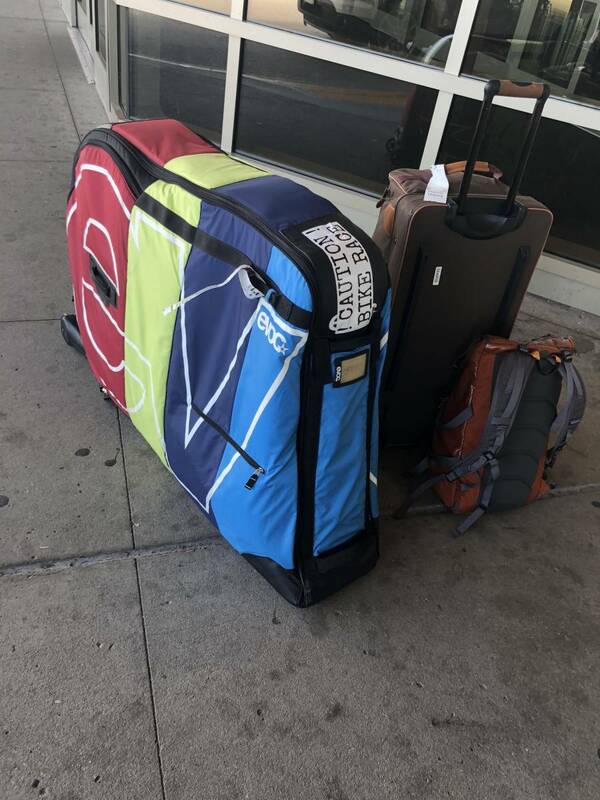 The CTS crew immediately took my bike bag, told me they would take care of setting it up and unpacking it and to go check in and come back for a spin. Sweet! Here we go! I got checked into my room, put on a kit and went out for a spin! The energy in town was building as riders came in and I was actually amazed I was there, riding and ready for this! The next day we had a great course start recon ride with about ten folks associated with CTS. Two coaches and the crew getting us all together and I was so psyched. 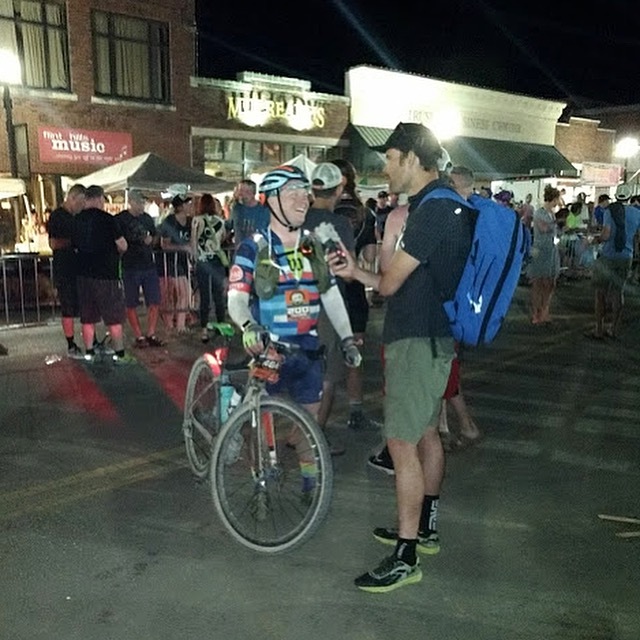 We chatted on the route about course conditions, gear choices, aid station tactics, nutrition timing, hydration plans, tire pressures, I was like a kid in a candy store soaking it all in and leaning everything I could from those that had done this before. The advice my CTS coach Reid Beloni had given me was totally on point and while I was leaning a lot I was very aware that I should “do me” and follow the plan I had in place. I had been told not to make any major changes to my strategy that would negatively impact my chances of success. 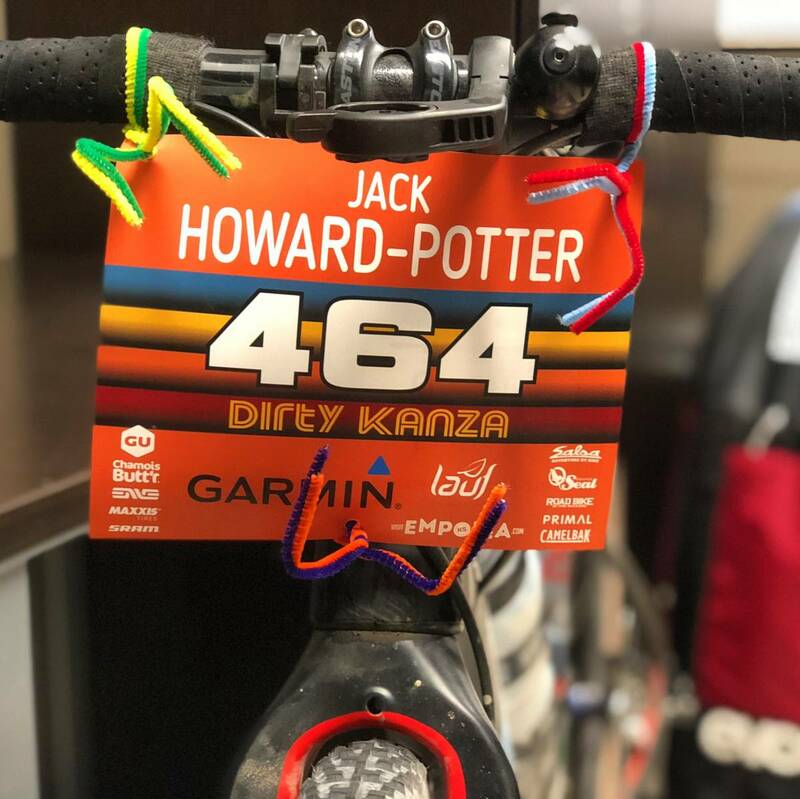 If I switched food it might upset my stomach midway through, if I changes my bike it would feel different, I should do what I have done in the months before and use the things that had made me successful in the Croatan and my own 150 mile ride. This was great advice because there is the tendency to self doubt and think that somebody else knows better than I do. I had the thought to change things a few times and I kept remembering to execute my plan and not change that. I was getting more confident in my plan and more anxious about the plan the Flint Hills had for me the next day. I packed my aid station bags with exactly what I wanted and needed and most importantly what I had been using for the last six months. The only change was to add six packages of Hostess Orange cupcakes to the bags. I had been treating myself on long ride with these at store stops for months now and realized that if there was ever a time to have a treat it was going to be during the DK200. I dropped them off with the CTS crew who would have them at aid station 1,2 and 3 and after a bike tune and look over and went to have dinner. I had been hydrating all day, eating perfectly for days and fueling and went that night for custard, fried cheese curds, cheese burgers and root beer floats for dinner. I was ready and eager. Race morning I opened my eyes about three minutes before the alarm went off at 4:00am. I went over to the universities dining hall and got breakfast. 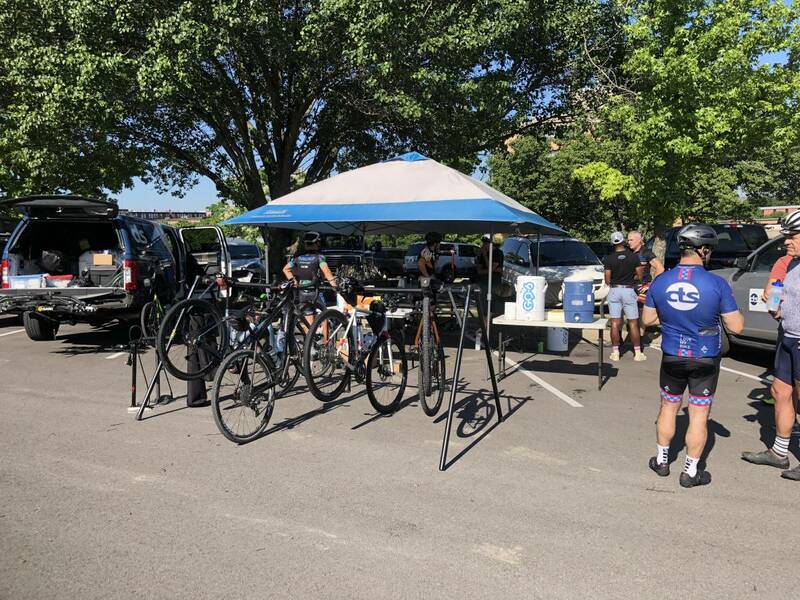 The place was filled with riders, some in kits, some in pajamas, some wearing helmets, packing bags of English muffins and peanut butter, ice in camel backs….name it people were doing it. Yoga! I was nervous. Should I eat eggs like that guys, have brought a thermos for coffee, drink a ton of water? I got myself together and did me. I ate what I eat, drank coffee, milk, cereal, yogurt and fruit, had some granola and water and got out of there. I was so surprised how quickly I wanted to do something different seeing everyone there. I went back to my room and got dressed, filled my bottles and camel bak and realized that I had put my drink mix in the aid station bags. Now this might not seem like a big deal but it was. As I have said changing things can ruin a day. If I used an unknown drink mix it might not agree with my stomach, make me cramp or throw up. If I used nothing I would be in a hole with calories and nutrition. The first 50 mile leg is also very important because it sets up the whole day, as I have said I am prone to go out harder than I should because of the adrenaline and excitement and therefore use more energy that is very important to replace. I got worried, scared, fearful……….am I ruining everything? I thought back to my own personal 150 in Harriman, I had my drink mix with me but the water fountains were not on yet in the park. I had gotten through the day buying Poweraid at soda machines and mixing it with water, also bought from soda machines. I went to the dorm lobby and bought some from a soda machine and prepped my bottles, hopefully this would work. 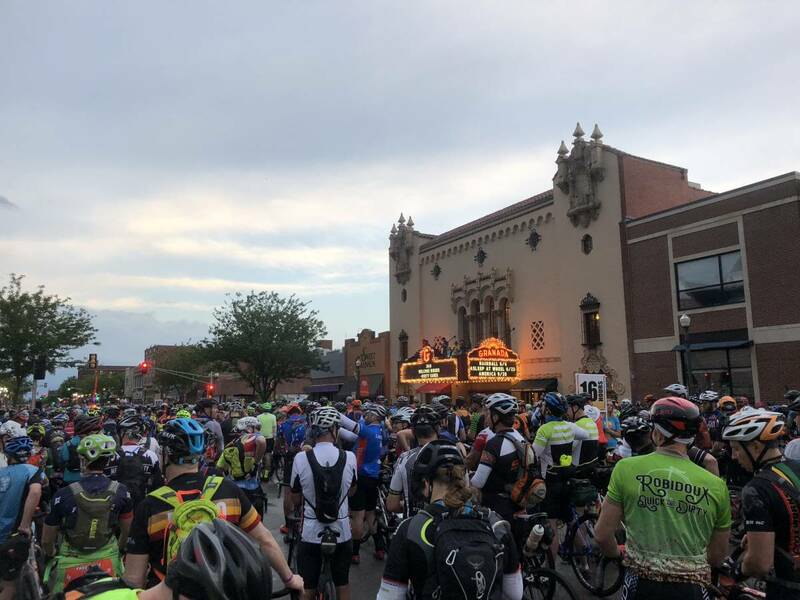 As I stepped outside to ride to the start line the air was charged with electricity, lightning was flashing and the clouds and wind were omnious and whipping. It started to rain and I heard that the start had been delayed 30 mins for the storm to pass. Uh oh. I retreated to my room and waited. Texted friends at the start, looked at the weather radar, worried about the mud on course, felt like this could all be going wrong. I made a plan to head to the line at 6:15 and hope for the best. When I arrived at the start line the crowd was huge, Jim Cummings the Race director, was standing on top of the Grenada Theatre marquis and I lined up with Mike. The energy was electric and the crowd was a mix of nervousness and excitement. When the gun went off I rolled out of town with Mike waving, smiling and thanking every person cheering on the side of the road. I was struck by his positivity, enthusiasm and joy at just getting to the start. The start was lined four deep for the whole length of main street with people, taking pictures, cheering, holding signs, happy. I realized I had made it, I was here about to embark on the thing that scared me. Mike lifted me and I choose to be happy and excited, I started ringing my bell and waving and we were off! The first 50 mile leg started with an almost immediate route change. We were following the route on the GPS, that we rode the day prior until everybody around us all looked up the same time and said “we’re off course”. We were still in a huge line from the start and couldn’t have missed turn, the whole field seemed to be going the wrong way. We followed as did everyone and I later learned that the storm that blew through had so muddied a nearby road that the race bypassed it. After finding the course a few miles down the road it was time to begin this work and pedal and have fun. The clouds were low and grey and the day seemed cool and dank. I wondered how this was going to go and just started doing what I had practiced. Pedal, eat drink, repeat. The clouds burned away and the sun came out and the hope that is the DK200 started building…….until I saw the carnage. Flat tires, crashes, broken bikes, broken bodies. 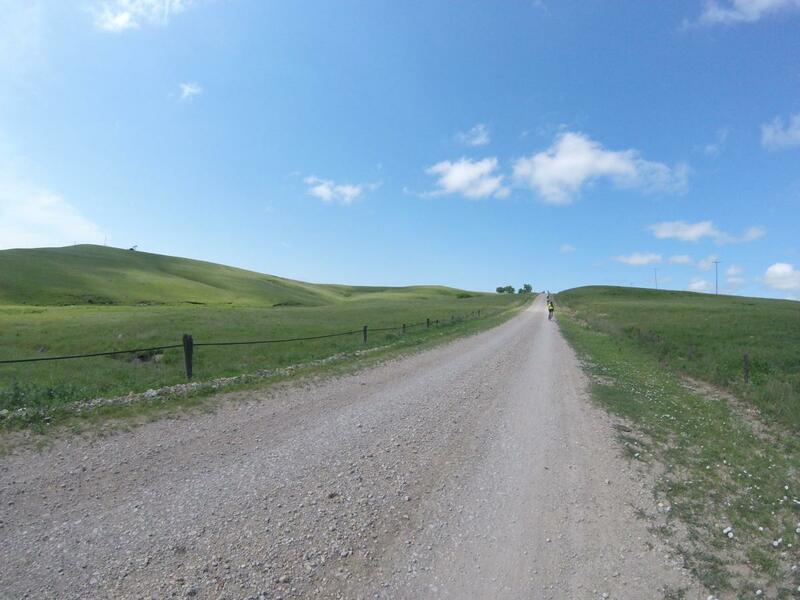 The terrain is demanding, the roads are unmaintained gravel country roads. There are low water crossings everywhere, streams, rocks, branches, dead animals. The descents hold huge boulders that rattle riders as the gain speed going downhill. I have never seen so many people changing flats in my life. Every time the road dipped downhill and there was a wash or rut to go over inevitably someone was changing a flat on the other side. The cattle guards broke spokes, deraillerus, rims, it was unreal. We entered a magical landscape of flowing green grass that goes on forever with a tan brown ribbon cutting through it, over hills and off into the distance. These cattle pens are some of the most lush and perfect cattle grazing grounds on earth. The green is the color a picture cannot capture and words cannot describe. Rich, lush, in a word absolutely green. I was becoming mesmerized and complacent until I saw the bright red of some poor riders blood against it. The clash jarred me as I came over a rise and saw a rider sitting on the side of the road bleeding from the face. 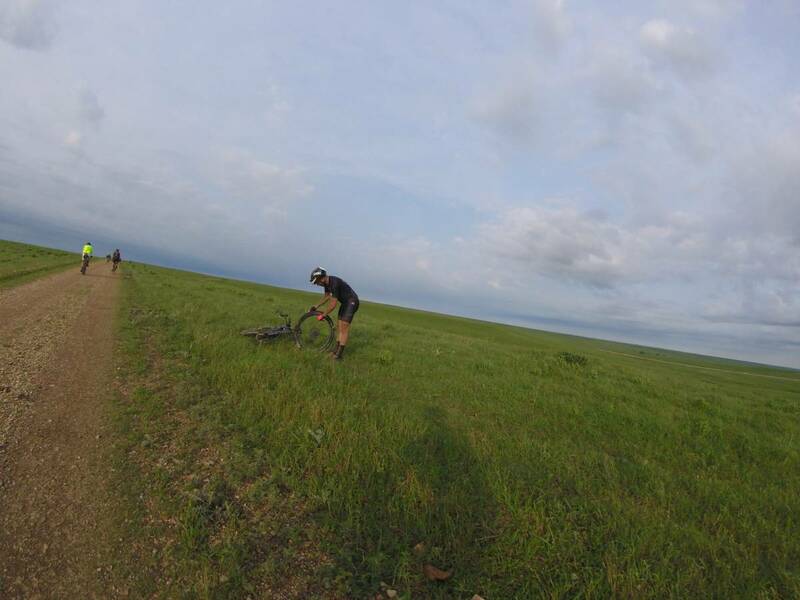 He had gone down on a small but very technical and rough rock outcropping descent that rattled everyones bottles off their bikes and glasses down their nose. Another rider was holding what looked like a white sock to his face that was soaked in blood and it dripped down his face. I saw the scene for about a half second but remember every detail. This was serious and although we were only about 20 miles from town it felt very remote and help seemed a long ways away. 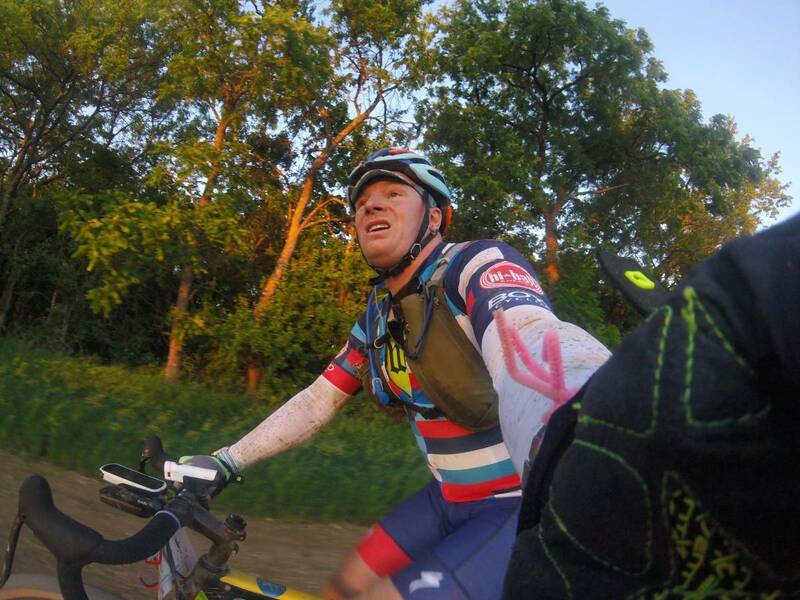 As I rode on and saw the trail of dust miles ahead racing towards me from a jeep trying to reach the injured rider I tensed up and focused on the roads. Two vehicles passed me racing towards the rider followed by an ambulance about 15 minutes later and I burst out into tears. Rolling along in that majestic landscape realizing what I had gotten myself into, that I was there in the midst of my dream, the mix of elation, fear, love, loss and everything in between flooded out of me. As I sit here now on the plane home writing this the tears still come. It is a mix of happiness, fear, fatigue, sacrifice, the support others gave me, the gift of it all, gratitude. It overwhelms my ability to accept it all. Feeling that on course felt absolutely right. It exemplified the magnitude of the task. The before, during and after. I pressed on with a resolve to give everything I had been given in this process back to this course and into my bike and body. Check point one came quite swiftly after all that and I rolled in feeling great. I knew I had the right drink mix waiting for me, my stuff, food and support. 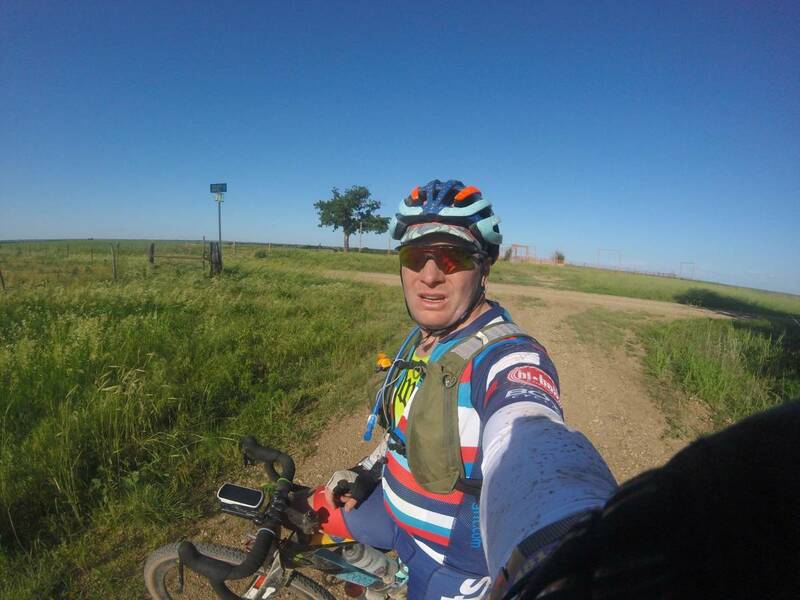 My bike was whisked away to have the mud a grime cleaned off the drivetrain, my camel bak was filled with ice and water, new bottles and food in my pack and I was on the road again in minutes. I had a new resolve and joy as we went out on roads that didn’t seem real. Grassy paths through the fields with rocks underneath that flowed like garlands through the landscape. Riders greeting one another, taking pictures and having fun. I pulled out my GoPro every 15 or so miles to photograph the landscape and surroundings. It was like being on a different planet that was lush, rich, fertile and alien. The remoteness of the area coupled with the wind which was blowing at our backs at 30 miles per hour made it feel like I was floating over the roads among the clouds. I tried to photograph it but wish I could capture what I felt like to flow along looking up at the clouds and not moving in relation to them with the green fields passing underneath like a huge treadmill. It was magic, but I knew we had to ride back north eventually and the doubt and fear started building. Check point two came very fast due to the tailwind and I rolled in feeling very good. My bike was holding up well and as the mechanic took it I noticed he was putting air in the back tire. I repeated the steps from CP1 and filled bottles with Secret Training, Camel Bak with water, pack with ProBars, Gu Stroup wafels, Trail Nuggets, Clif shot blocks, SIS and Secret Training gels and opened up my two packages of Hostess Orange Cupcakes. My stomach was feeling a bit empty and the sugar and cake with a bottle of ice cold water and some ice socks in my jersey refreshed me in a way that felt like heaven. I was halfway through this grueling, fun, long crazy ride and had had a tailwind for the last few hours was buzzing with adrenaline, little did I know then the third leg would be the worst 5 hours on a bike I have ever had. The third leg, mile 104 to mile 161, about 57 miles took me over 5 hours. My average speed was only 11 miles an hour. That 30 mph headwind that I relished coming south was now pushing against me, pounded me on the nose. The wind was absolutely soul sucking. The worst heat of the day was upon us and the sweat was drying as it was coming out. The salt built up to the point I could taste it on my lips. I tried holding onto wheels and just didn’t have the ability to do it. I rode solo the whole time and it felt like a death march. The incomprehensible beauty of the landscape, fields, ribbons of hero dirt, cows and farms went on forever and it felt like the whole time the end would never come. I was passing people still fixing flats the entire way but now there was the added carnage the wind was doing and people were stopped under trees, bushes, sitting in grass so tall you could only see a head and hunched shoulders staring at the ground with their head in their hands. Riders were lying down flat on their backs wrecked from battling into the wind and being assaulted the whole time by it. Water resupply was so scarce that I saw one rider stop a farmer passing by to ask for water and he handed him the last third of a gallon he had in his truck. The rider tipped it back and drank the whole thing in one shot. People were passing me and I would then see them down the road totally gassed from the effort twenty minutes later lying down. I kept my tempo steady and rode on, resting my forearms on the handle bars to relieve the swelling in my hands. I did this for hours. I entered a state of total zombie death march. It felt like at each hill the horizon and check point got further and further away. I had it in my head that the third check was another 50 miles but when I saw 150 miles tick by on my Garmin I was completely alone and had another 11 miles to go. It felt like a hundred. I thought with every pedal stroke that I could never finish this. The pain of the slow speed, wind, dehydration, monotony just blew me away and I really thought if I could just make it to CP3 I could throw in the towel and have had a respectable day. Finishing seemed impossible and since my longest ride to date had already come and gone I didn’t think I had any more left. I passed up a farmer with a hose out from his porch at about 152 because I was sure I was almost there, only to spend another hour suffering sipping on a half a bottle of 90º Secret Training dregs. I wanted to quit when and if I got the CP3. Then I climbed the hill to see a mini van in the middle of nowhere with two coolers on the side of the road. Riders were clamored around it like an oasis in a desert, each rider in front of me was stopping and I wondered why. When I got there all the doors were open and in every seat was a rider, helmets on, glasses on, bikes thrown on the ground, with their heads either back or bowed in exhaustion drinking the sweet sweet life blood that is cold Coca-Cola and water. These folks had been out there in the heat for hours with a cold cooler of Coke and another with water helping riders. They had their kids there and not one of them was in the shade or seated. They allowed the riders all the comfort that existed in that moment and were just helping us out. It was so selfless, humble, kind, generous and remarkable that I approached speechless. I opened my mouth to ask for a Coke and my lips stuck together and I had a croak come out of my throat. My mouth was so dry I had to ask twice and the cold sweet nectar that I was handed felt like the greatest gift I had ever been given. I stood there knowing I shouldn’t drink the whole thing but unable to stop myself. It was SO good I felt saved. I filled up a bottle with water and remarked to our hosts that it was such a generous and kind thing they were doing. They shrugged and just said to have fun and keep going. This was a huge theme of the weekend, the community that surrounds this race was so kind and generous, they welcomed us individually in Madison with a man on the side of the road yelling to every rider “Welcome to Madison!” and as if that wasn’t enough he continued with “Thank you for visiting!” They love that riders come there, they support the race and riders, they give of themselves and their lands. It was so amazing to see how they embraced us and relished the chance to cheer everyone. It was part of what made it so memorable and special, I felt like it was for me, and it genuinely was! With the newfound hydration and sugar I made it finally to Check Point 3. Rolling into CP three I got off my bike and told the CTS mechanic that the rear tire had been low for the last 50 miles. I had seen the mechanic in CP2 putting air into it and when it got soft at about mile 109 I stopped to check it. I saw no visible leak, no sealant coming out and no holes, I decided to let it be and ride it squishy and am sure that is also what made the third leg so slow. He began working on the bike and I went into training mode and habit and stated opening my drop bag to dig out food, bottles and cupcakes!!! I ate two packages all the while chugging down pickle juice. The salt tasted so good and the sweet nourishing cake filled me up and absorbed some of the coke. My stomach was feeling a bit rotten from the coke but I realized that I was only 40+ miles from the finish!!! All thoughts of quitting were gone and I readied myself to get there! I strapped lights to my bike with the help of the CTS crew, loaded bottles, put so much ice down the back of my jersey and ate everything I could find and just climbed on and left. People were rolling in like zombies, wide eyed and confused and I wanted to get out of there and Do Me! I started the fourth leg with hope and optimism and anticipation that this crazy dream I had might be possible. Riding through the sunset was the most beautiful natural transition, that is the beauty of experiencing the landscape on a bicycle. You can cover a lot of ground but still feel the nuance of time and space that disappears in a car. 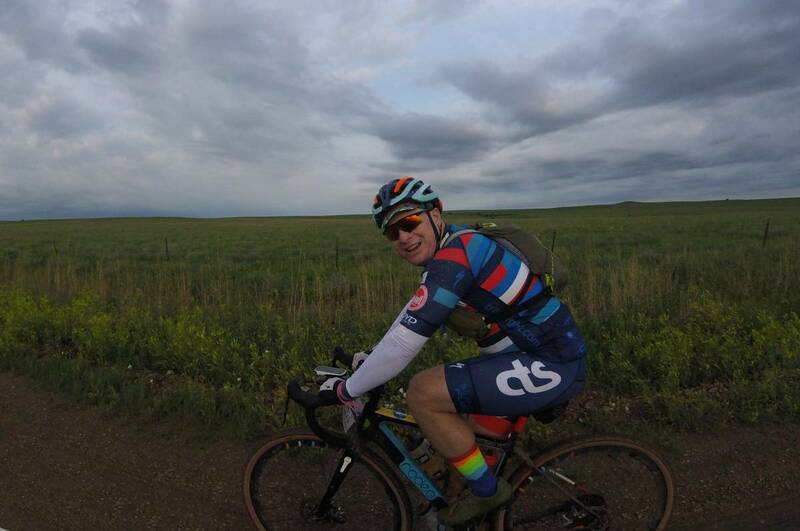 I watched the sky mellow, the sun go down and the colors form and all of a sudden I saw in that sunset the design for the Dirty Kanza 2018 kit. Blue, yellow, orange and red stacked up like the changing light on the horizon. I had bought one upon registration and usually when that happens I never wear an event souvenir until after I complete the event because I don’t want to jinx anything. But in this case I was doing so much hard training and preparation I decided to wear it as motivation for my goal. There riding along looking at the sunset I saw the deisgn on that kit and knew I was going to be ok. I pressed on into the dark! Riding in the dark was almost a relief. The sun went down and I turned on my lights and could see on the horizon the faint red blinking of a rider in front of me. It was sort of soothing to know someone was ahead and someone behind from the lights. The undulations that had dogged me all day were reduced in the lack of distance visibility and I just pedaled into the small cone of light my bike was putting down. 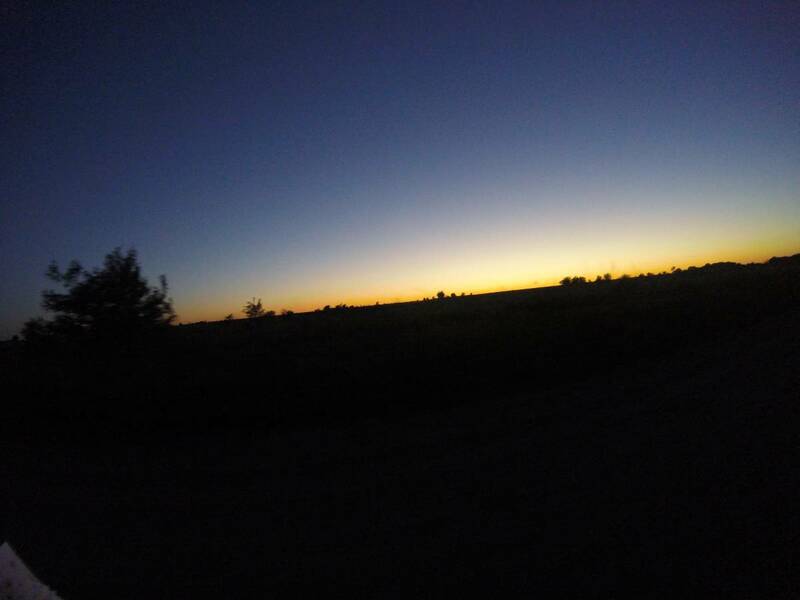 The night riding was magical, the blanket of stars that cover the sky was incredible and the temperature finally cooled down. I knew that I couldn’t be ore than 20 miles or so away and then I saw the chaise! 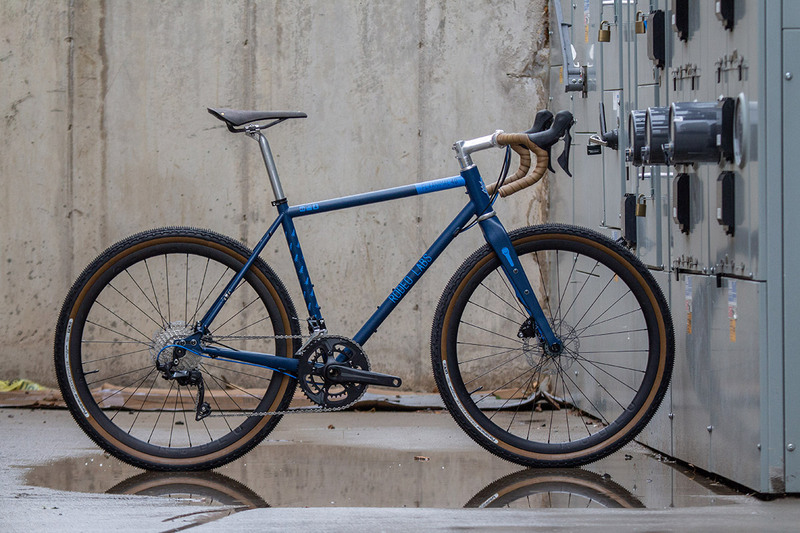 Salsa cycles has a Victorian chaise that they drag out to a remote spot on the course of five races. 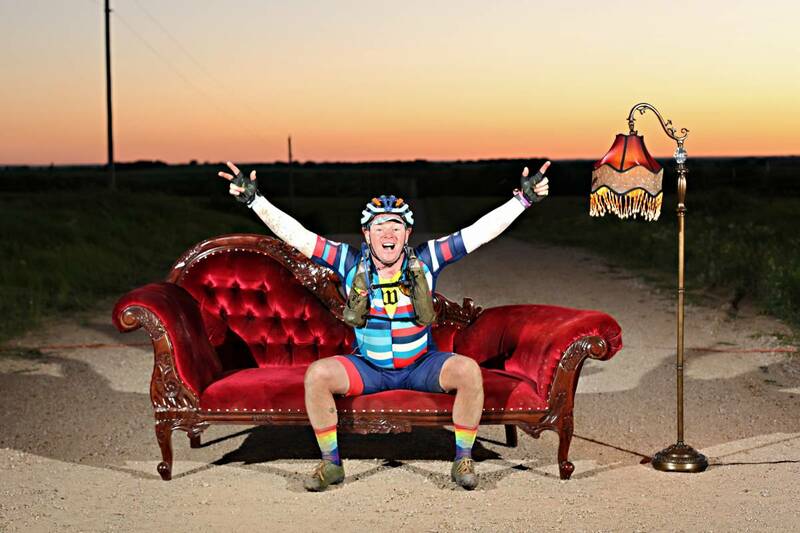 They encourage every rider to stop and have their portrait taken, the promoter said at the rider briefing “if you can make it to the chaise you can make it to the finish” and I believed him! I stopped and yelled into the camera in excitement and pain and continued on. scottharaldson.comAbout ten or so miles from town I could see on the horizon the waving of searchlights. You know those banks of lights pointing into the sky and waving back and forth. As soon as I saw that I knew I was close. The course weaved back and forth for a while until we were in the last miles and the elation and suffering that I was experiencing were completely equal. I kept thinking “can I please be done now?” and “I can’t believe I did it!” on the way to the finish line I cycles right past where I was staying and wanted to just stop and go to bed but knew the line was about 1000 yards away. As I rolled into town in the pitch black at 11 o’clock at night I could hear the party going on at the finish line. Cruising down main street with people still lining the barriers two and three deep the noise was deafening and the hands outstretched for a high five were everywhere. I heard the announcer call my name as I came down the chute and I was finally finished. I had completed my dream to do the Dirty Kanza 200 and it was over. I hugged the volunteer who put a wet cloth on my neck and saw the CTS crew cheering for me and waiting there. The joy, pain, relief, thirst and exhaustion all hit me at the same time and I was really in shock. A Velo News reporter grabbed me and asked if I would do an interview and we chatted for about ten minutes. The question he asked me that I remember most was “what is the most memorable thing about this event?” Honestly it is the people of the community that support DK200. The welcome we got, the support we had on course, the openness of their excitement for every athlete was contagious and unique. The city of Emporia, Madison, Eureka and the surrounding areas made the day what it is, magical. I can’t thank them enough and will use their enthusiasm as a model to follow in my own life. Finally finished I really needed to sit down. Chairs were scarce, the food trucks were all closing, but people were everywhere and I just decided to sit down right in the middle of main street on the yellow line. My body was mashed, my mind numb, my goal met and heart full and I called my wife back home. When she answered I could only say thank you. Thank you for the hours of sacrifice, time with the kids when I was training, travel and preparation I had to do. Thank you for supporting me throughout this whole crazy dream. I sat there in the middle of the street, spent, tired, elated and cried. I was thrilled that my CTS coach Reid Beloni was there and the hug and converstion afterwards brought the whole experience into perspective. I had just completed what I dreamed about for so long, the hard work I put in, the support I had, the coaching, the numerous times out on the road in the freezing cold, pouring rain, hard rides where I wanted to quit had all added up to this moment. I honestly didn’t know what to do or say. I was literally numb and overwhelmed. I got a few photos and knew all I really wanted was a hot shower and a bed. Riding back to my dorm room and leaving it all behind I realized that I was changed, a different person, my perspective on this event and its significance in my life swelled and I knew it had all been worth it. I would carry the experience, stories and people connected to it all my life and I was grateful to be able to add all of them to my life’s experience. Most of all I was tired and I cleaned up and went to bed. So…. How do you sum up something in words when the emotions associated are so much bigger? That’s my attempt, hope you enjoyed it and go challenge yourself, scare yourself and see if you can get through it. I bet, if you put your mind to it, you can do anything……even something scary.